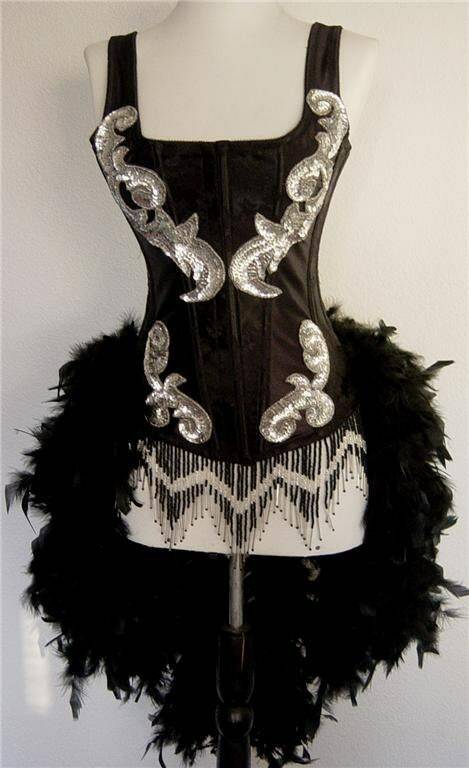 Elegant burlesque style costume made with a black brocade bodice base adorned with an ebaborate sequin and bead design. 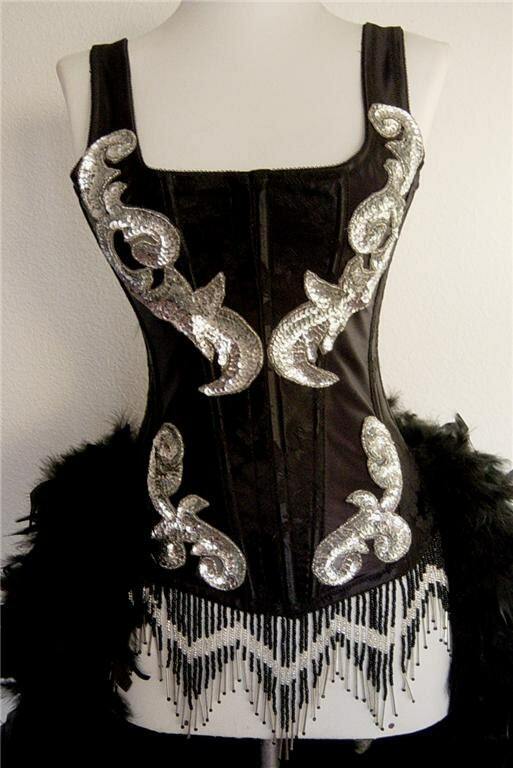 Bodice is boned with steel coil and solid steel boning with hook and eye closure front and lace up back. The train is made with heavy weight white feathers that taper in a V shape toward the back and long red and silver glass beaded skirt in the front. Please refer to sizing chart below. You will need to purchase some kind of garment to wear underneath. If you want the laces more closed in the back and you are in the upper end of measurements consider going up one size. I have been in business since 1999 designing custom made costumes. I sell to several costume shops around the world and have won several design awards for my designs. My costumes have been featured in many Vegas Casinos, Canadian Casinos, and theater events. I do offer options to have your very own design made. Please contact me with your requests. INTERNATIONAL bidders, I do ship World Wide! Costumes must go Priority or Express USPS with tracking. Please be aware of your import policies. You may be responsible to pay a duty if your country requires it on imported items. I accept Paypal and credit card online or over the phone. The fine print: I want to ensure you are thrilled with your purchase. If you find the costume is not for you, doesn't fit right, damaged, etc. Please contact me after receiving your item within 7 days. I will be happy to exchange for another size or you may receive a store credit towards another costume for any unused costume. Since costumes are generally occasion specific I won't accept returns to prevent one time use returns but I will work with you to ensure you are satisfied with your purchase. Thank you for stopping by. I look forward to working with you! 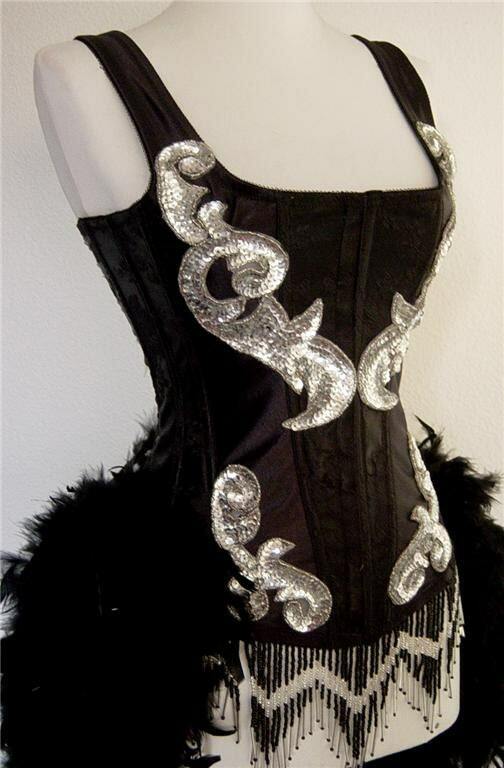 All costumes designs are copyright Fantasy Masquerades/Denim & Diamonds. Please note I cannot guarantee any shipping time unless prior arrangements have been made and Express Mail is paid for. Express is the only shipping option that is guaranteed through USPS, we have no control over shipping time. If you pay for Express Mail please allow for the normal production time before shipped which is 1-14 business days. Please make note of your individual listing estimated production time. Each listing will have production estimates, not all have the same production time. I will do my best to accommodate your timing needs. Please contact me if you need something faster than listed otherwise it will be produced as usual. Rush fees may apply. INTERNATIONAL buyers, Express is different than Express Guaranteed. Express is not guaranteed like it is within the US. If you want Express Guaranteed please contact me to receive a proper invoice. No returns are allowed. Any new unused costume can be exchanged for another size or store credit within 14 days of receiving. Please contact me if there are any concerns or questions about your order during this time. In the event you receive an item damaged your item will be exchanged promptly, but no refund will be given. Buyer is responsible for shipping on an exchanged item. Any refused packages or unauthorized returns going against our Return/Exchange Polices will be charged a 20% restocking fee and shipping is not refunded.